The Ghadr is a medium range ballistic missile modeled after the Iranian Shahab-3. Some notable changes to the Ghadr from the Shahab-3 are: reductions of the rear fins’ size, weight reduction, smaller warhead mass, and a new guidance system. The Ghadr has a maximum range of 1,950KM. It is a two-stage missile with the first stage using liquid fuel and the second stage using solid fuel. The missile is currently made to carry a conventional warhead but is capable of being armed with a chemical or nuclear warhead as well. 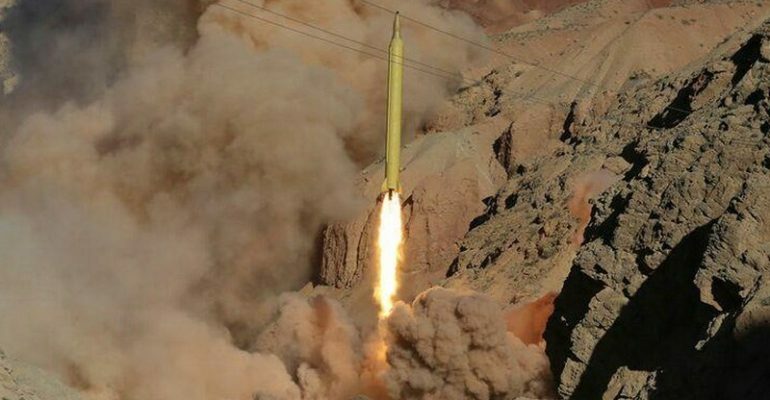 Iran reengineered the nose of the missile to give it a “baby bottle-shaped nose cone”. This new shaped nose allows the warhead to reenter with greater speed. It also gives the warhead the capability to detonate in air above its target. The Ghadr is road mobile and has a thirty-minute set up time compared to the three-hour set up time of the Shahab-3. It is also believed to be generally more maneuverable than its predecessor. It is believed that Iran started experimenting with the two-stage missile in 2004 as a start to the development of the Ghadr-1. The first noted test was in November of 2015. The Strategic implications are still very similar to that of the Shahab-3. Although, this missile has more consequences because of its redesigned shaped nose. The Ghadr warhead has faster re-entry speeds which increases its ability to pass through missile defense systems. The warhead’s ability to airburst also threatens its targets with an EMP that can be more devastating than a traditional nuclear warhead in some instances.